A pile of eleusine coracana in a homestead. This crop was once the most important base for porridge and beer, but has been displaced to some extent by manioc, a highly drought and pest resistent tuber, which is however somewhat less nutrious than flour produced from grain such as eleusine. 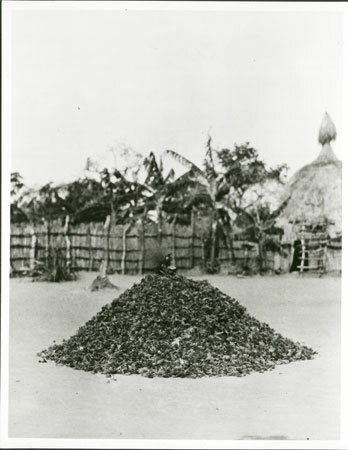 The pile has the magico-religious medicines dakadiya and ngamu (a feathery type of grass) placed on top to invoke increase. Beyond is a large old style granary (soro) with grass finial, with a ladder up to a door some feet off the ground. Morton, Chris. "Zande crop with magic bundle" Southern Sudan Project (in development). 03 Jan. 2006. Pitt Rivers Museum. <http://southernsudan.prm.ox.ac.uk/details/2005.111.13/>.